This Big Agnes Tensleep Station 6 Tent review is about the new 2018 version of the very reliable 3-season tent with a full coverage fly. Big Agnes Tensleep Station 6-Person Camping Tent. Full coverage fly for a complete protection. It allows for several awning configurations. This Tensleep Station 6 is a new 2018 version of the famous tent from this renown brand. Both versions are on the market and you will easily know the difference – the new is in this green color which you see in the pictures here. There are no differences in size, just to know; they are exactly the same. 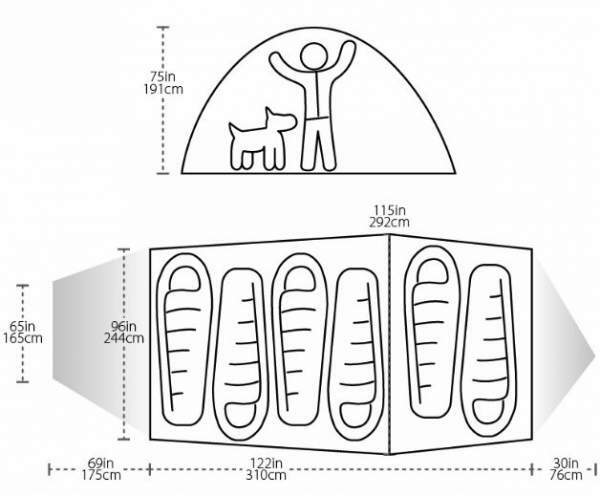 The tent is an extended dome type, so you have the main dome part which is freestanding, see the picture below, but the extension is not, so it must be staked down to be fully functional. See how the main dome looks without the fly and without the extension. The Big Agnes Tensleep Station 6 without the fly. As you realize, you have 3 poles in the main dome part and there are 3 intersections, so this is what makes the structure very strong. The more intersections the better. The tent is a double-layer type. There is a lot of mesh in the inner tent and the fly is full coverage. So you have a full protection from elements. 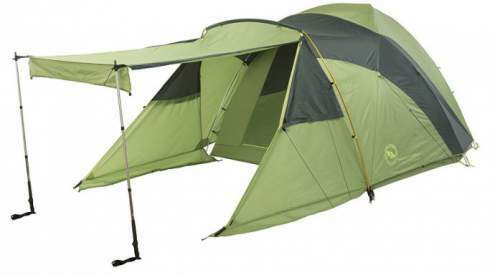 This is a very reliable 3-season tent. You might want to know, this is something from the US history, about the tensions between sheepherders from southern Wyoming passing into Colorado, which ended up the Tensleep Murders or the Spring Creek Raid. Big Agnes brand uses the names of historic places for their items. The floor plan and dimensions. As you see the tent is very wide, almost three meters, and this allows you to put some stuff on the sides. There are two vestibules though only one is large enough to store your stuff or to do some cooking. But in any case, I would not use this tent for more than 4 people. Note that the proportions in this picture are not accurate, but this is from the manufacturer, so this can be confusing – it looks so elongated while in the reality the two main inner dimensions are almost the same, i.e., 292 cm and 310 cm. 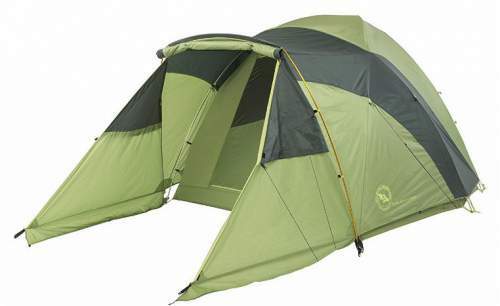 Seasons-wise, I have already said, this is a tent for 3-season use and it will protect you in any weather conditions. The weight is 18 lb (8.16 kg), though they also give the trail weight which is 16 lb 9 oz (7.51 kg), but this is a bit too heavy to carry on the trail. So it is best suited at places with a motorized access or where you do not have to carry it yourself. The packed size is such that you can transport it on a motorbike as well. This is the back entrance with the smaller vestibule. See the vent on the fly. 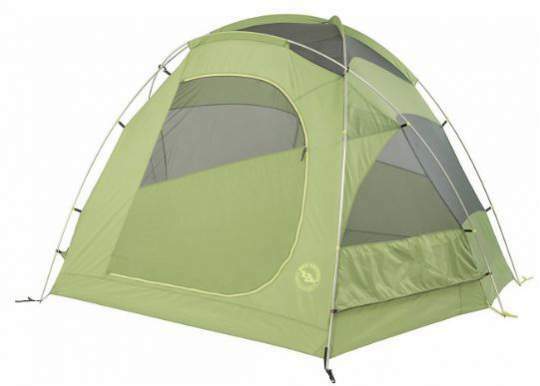 The inner tent is a durable polyester with mesh panels for air circulation. There are enough of such mesh areas to work against condensation build-up. The floor is polyester coated with waterproof polyurethane so this is a very reliable and durable structure with a bathtub design, all done properly for a full protection. The same material is the fly and the waterproof rating for both is 1500 mm. This may not look too much but this is more than enough for any 3-season use. With all seams taped and with the full fly coverage you are completely protected in this tent. You have seen in the picture above that the poles are kept in place with sleeves on the top of the inner tent, and with press connectors in other areas. The sleeves have their great role in the stability of the tent when you do not have a hub element. A tent becomes freestanding as soon as you pass the poles through such sleeves and fix them in the grommets. Some people dislike sleeves, but in the present case they are not long, so passing the poles through them is easy. Note that the fly can be rolled up when it is not raining and you can have an increased visibility and ventilation in such a setup, see the picture below. There is one vent on the fly, I would love to see more. You have Velcro tabs that connect the fly to the pole structure for extra stability. Here, the fly is rolled up for ventilation and visibility. Here, the vestibule flap is rolled up and side wind-barriers are in place. The poles are a lightweight aluminum and you have them 4. The 4th pole is used for the vestibule and it goes over the fly, through the external sleeve. This is a clever system which allows for several nice configurations with the main vestibule, you can see it in pictures. The doors are big and positioned on the two opposite sides. When you are inside you realize this is a rather tall stricture with 75 inches (191 cm) peak height. It is surprising how many storage elements you have here; those include 4 interior storage pockets, 2 cargo pockets, 2 media pockets, and also gear loft loops. The tent is with 2 vestibules, the rear one is quite small. The real gem here is the main front vestibule with its 38.5 square feet of the covered space. I would say this is the best part of this tent. Can you believe that you have two mesh windows on the vestibule? This is a great feature for extra ventilation because the fly is only with one top vent. The main front flap on the vestibule can be used in several ways and you can create a pleasant awning, see the pictures. The awning created with the help of trekking poles. Here the same awning but with windbreakers on the sides. 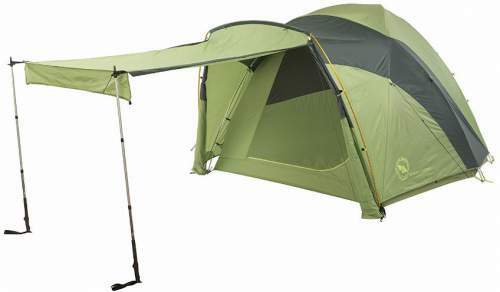 Note that the tent comes with 19 lightweight aluminum hook stakes in the package. The bag is a briefcase style, with shoulder straps and organizational pockets. Packed weight: 18 lb (8.16 kg). Trail weight: 16 lb 9 oz (7.51 kg). Total dimensions: 221 x 115 in (561 x 292 cm). Floor area: 90 ft² (8.4 m²). Vestibules area: 38.5 ft² + 10 ft² (3.6 + 0.9 m²). Peak height: 75 in (191 cm). Poles: 4, press fit aluminum. The differences are not big in any of the most important parameters. But see also the prices of the three tents; as of the moment of writing this text, they are respectively, $500, 454, 230. In the summary of this Big Agnes Tensleep Station 6 Tent review I wish to stress that this new 2018 version of the tent is essentially the same, the dimensions and the functionality have not changed at all. The color is the main/only difference here. So this is still a great tent, though rather expensive, for experts and for those who need a truly reliable tool for a full protection from elements. This is why I have added it to my list of the best dome camping tents. You might want to know that there is also a 4-person version available on the market and you can see it here. Thank you for reading. If you need something different for family camping, just look around. This whole site is only about large camping tents and I am sure you will find something suitable for you. You might want to check also this new 2018 redesigned Marmot Halo 6 tent built in the same style. 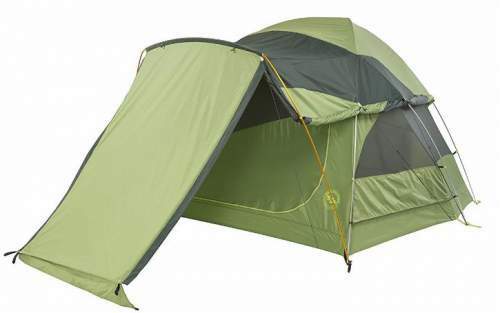 For a more affordable and simple tent, check this Kelty Acadia 6. 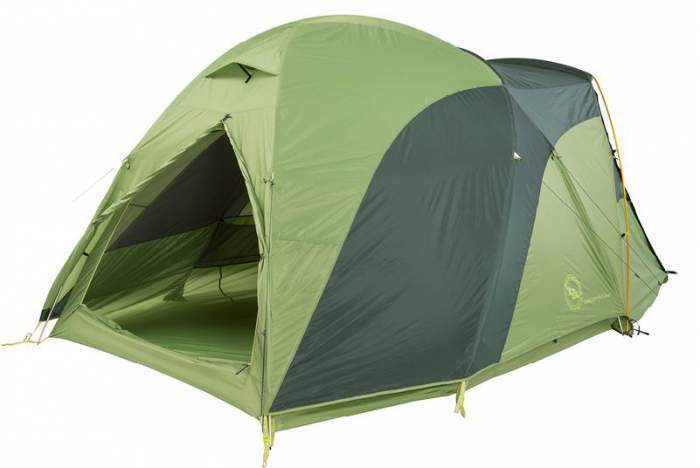 If you need something for 5 people, please check this Mountainsmith Conifer 5 Plus Tent, a lightweight and reliable tent. Please use the comment box below if you have any comment or question. Have a nice day.